As we fast approach another packed weekend of wrestling, we look forward to what will in fact be a historic weekend not just for British wrestling but for independent wrestling as a whole. But more of that later. For now, let's get Ready For The Weekend! Up first on Friday night, VII Pro Wrestling return to The Hive in Shrewsbury with Urge To Thrill... Rising! which will feature their inaugural Trifecta Trophy tournament. This tournament shall see trios teams compete with the winner of the one-night tournament being crowned the Trifecta Trophy tournament winner. While we don't know which teams shall face which, we do know that the teams in the tournament include some of the best wrestlers in the UK today. Teams like, The Number One Offenders that includes Damian Dunne, Mike Bird & Flash Morgan Webster. Or The Bruiserweights which includes CJ Banks, Dan Moloney & Pete Dunne. That is only two of the teams competiting so you can see the amount of talent involved. It won't all be tournament matches on November 13th though, as Lana Austin will face Nixon Newell with the spot in the Shropshire Wrestling Alliance's British Lions Championship ladder match on November 28th up for grabs.We will also get to see Dave DelVecchio of The Number One Offenders in action as he competes against a man, who as of yet, is not part of any Trifecta team. That man being Wild Boar. The match itself should be a very hard hitting affair with both men known for their full force offence. 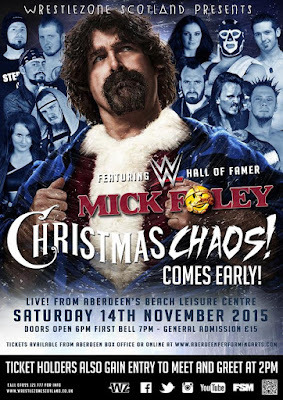 Moving on to Saturday and Wrestlezone will be at the Beach Leisure Centre in Aberdeen with their SOLD OUT Christmas Chaos (Comes Early!) event. There has been a lot of hype surrounding this event since it was announced that WWE Hall Of Famer, Mick Foley would be in attendance. That is not to say that the event is solely based around the WWE Hall Of Famer as the show has a stacked card. One match on the card this Saturday is The Rejected's Chris Archer & Mikkey Vago challenging Mr P & Kaden Garrick for the Wrestlezone Tag Team Championship. These two teams have exchanged wins and losses in tag team and singles action for the past few months in Wrestlezone. The Rejected has been calling for another shot at the gold and thanks to two wins of the champions in singles action, they will get another opportunity against the crowd-favourite duo of Mr P & Kaden Garrick. One man who has been making an impact in Wrestlezone in the past few months is Aspen Faith. Faith has demanded the best competition he can face. A few weeks ago he sent out a challenge to the man who claims to be the Best Young Wrestler, Lewis Girvan. He challenged him to a match on November 14th. However, Lewis Girvan countered the challenge by proposing an intergender tag team match with Aspen Faith & Sammii Jayne facing himself and Debbie Sharpe. The match was agreed with a contest between Sammii Jayne & Debbie Sharpe taking place last week in Huntly. It was Debbie Sharpe who took the win in her Wrestlezone debut contest on that occasion. Whether that is a glimpse of the result we'll see on Saturday, who knows. Either way we're getting to see four of the best wrestlers in one match. The main event for this Saturday will see Scotty Swift defending the Wrestlezone Undisputed Championship against Crusher Craib, Alan Sterling & Bingo Ballance. Swift has had a running feud with Alan Sterling and Sterling Oil from almost the moment he won the championship. Crusher Craib on the otherhand has been on a quest to recapture the champions since losing it earlier this year. The wild card is this match is most definitely Bingo Ballance. While only appearing in Wrestlezone on rare occassions, he has picked up some big wins in the past. Scotty Swift has been battling the odds since winng the championship but this is without doubt his biggest challenge yet. Finishing the weekend off and there was really only one show that we could talk about. The SOLD OUT, Insane Championship Wrestling Fear & Loathing VIII event at the SECC in Glasgow. Now, ICW are no strangers to sold out shows in big venues. However, this event is actually historic and record-breaking. This event is the highest-grossing since Big Daddy vs Giant Haystacks in Wembley in 1981. This show will also have a larger crowd that any US independent promotion (excluding ECW) EVER. And do you know why? Because it is stacked from bell to bell with incredible matches and talent. Every championship will be on the line during the event, including the ICW Women's Championship which will be presented to the winner of Nikki Storm vs Kay Lee Ray. Both of these women have progressed through a series of tournament matches in the run up to this event. Nobody can say they know the definitive winner of this match as both wrestlers are so equal in talent and desire to be champion. Fear & Loathing has been known as a place to end rivalries and one of the biggest rivalry in ICW in recent memory has been between Legion and the New Age Kliq. This feud started many months ago and has gotten more intense and violent as time has went on. The hatred between Legion's Mikey Whiplash, Tommy End & Michael Dante and the NAK's Chris Renfrew, BT Gunn & Wolfgang has now gotten so big that this match will be contested in a Steel Cage. Violence is nothing new in ICW but this match may well set a standard in violence that might never be surpassed. With Fear & Loathing VIII being the biggest show in British Wrestling history it is only fitting that the biggest prize in ICW, the ICW World Heavyweight Championship is on the line. The challenger to Drew Galloway's title? Probably the most recognisable face in British Wrestling today, Grado. Back in August, Grado announced that he would challenge for the ICW World Heavyweight Championship. An announcement that brought Grado into the sights of Drew Galloway, Jack Jester & Red Lightning who have attacked Grado at every opportunity. Others such as Chris Renfrew has also questioned Grado being in the main event. Something that has light a fire in Grado that has never been seen. Grado is looking to prove to the the detractors that he deserves to be where he is. While The Black Label's attacks on Grado may have been a way to make him change his mind, they have only focused him more. The time for fun, laughs and jokes is over. Grado is now looking to prove to anyone who said he shouldn't be in the main event that he deserves his place and he'll look to do that by becoming the ICW World Heavyweight Champion this Sunday in front of 4,000 fans.